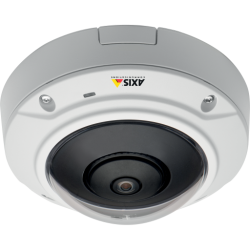 Panoramic cameras provide a 360º field of view, ideal for surveillance applications that require wide area coverage in a single view. Such cameras can be used to detect activities in a large area, track the flow of people and improve area management. With a wide-angle lens and a 5-megapixel sensor, these affordably priced fixed domes offer multiple viewing models such as 360º overview, 180º panorama, quad views (simulating four different cameras) and view areas with support for digital pan/tilt/zoom functionality.